Witteveen, J.E, Duijvestein, W, Knobbe, A.J, & Grünwald, P.D. (2014). 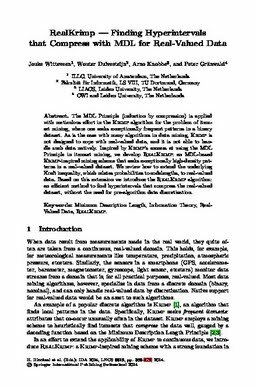 RealKrimp - Finding Hyperintervals that Compress with MDL for Real-Valued Data. In Proceedings of Intelligent Data Analysis 2014. Springer.